We require a 20% deposit from our customers in order to secure their reservation. 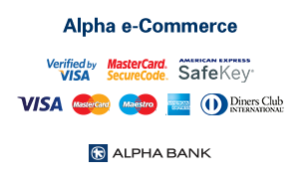 This deposit is paid via PayPal or “Alpha e-Commerce” of Alpha Bank that uses TLS 1.1 encryption protocol encryption with 128-bit (Secure Sockets Layer – SSL). Encryption is a way of coding the information until it reaches its recipient , who will be able to decode it using the appropriate key. That means we never request or keep any credit card or other financial details of our customers. Acceptance: Please read our terms and conditions thoroughly for more. By making/accepting a reservation through our website, you state your express consent with all the terms and conditions.